Grown at Hutchinson Farm since the 1990's. Available mid August - late September 2018. Sorry, sold out, it was a hot summer, so they finished earlier than expected, more August 2019! At Hutchinson Farm, our goal is to grow the very best tasting plum tomatoes possible. We do it by selecting varieties that taste great, and we grow tomatoes the way they are supposed to be grown. Did you know that just about all plum tomatoes are artificially ripened and harvested by machine? Yuck! That's not the way we do it! Our tomatoes are sun ripened, and picked by hand. This means they'll taste delicious, it also means they cost a bit more, but your sauce is worth it! We pick our tomatoes directly into ½ bushels -that's about 27 lbs. Full bushels are just too heavy, especially for the tomatoes at the bottom of the bushel! Our 2018 prices are $14.00/ ½ bu, 10 or more $12.00 each. You may use our tomatoes right away, if not, spread them out in a single layer (if you have a lot, a tarpaulin in the garage works well). This way the tomatoes will continue to ripen for about 5 days or more, depending on temperature and humidity. We have Roma’s (TSH32) or San Marzano’s (TSH35). San Marzanos are longer and thinner than Romas, have better name recognition, and celebrity chefs swear by them, but every single year, San Marzanos are the blandest tasting tomatoes we grow. 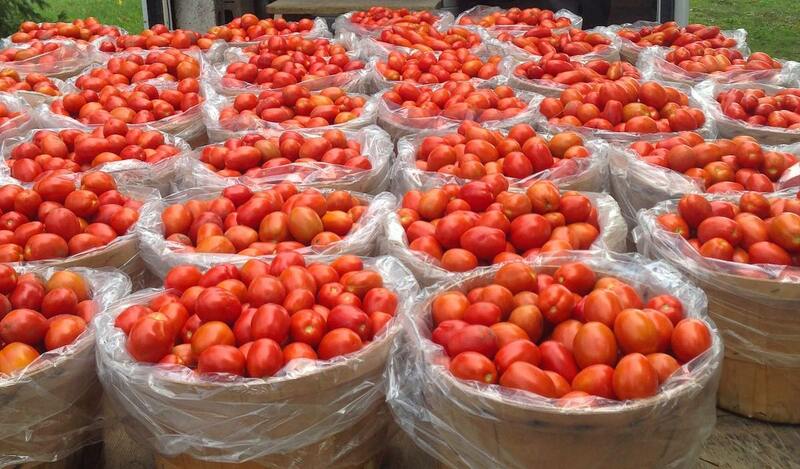 Our Romas have less water than the SM’s so we highly recommend the Romas! We expect a good supply until mid September, if you'd like us to put some aside for you, email or give us a call at 905-335-2515. Please see our Heirlooms page for more plum tomatoes!